In a bit of a reversal from a statement earlier this weekend, Diamondbacks manager Torey Lovullo told the Arizona Republic’s Nick Piecoro and other reporters that Jake Lamb will still see some action at his old third base position. Lovullo even considered using Lamb at the hot corner on Saturday to get some work in, as Lamb spent much of Spring Training learning on his new first base role, and also was briefly sidelined with a back problem. While Lamb hasn’t been much of a defender at third, it can’t hurt to keep him sharp at the position for the sake of roster flexibility. Just last year, the Rockies’ bullpen ranked in baseball’s bottom third, coming in 21st in baseball with a 2.2 fWAR. So far this year, their relievers are the best in the game using that same metric, with a 1.4 fWAR and a 2.80 ERA that’s remarkable considering the context in which they pitch. The Denver Post’s Nick Groke explains the bullpen’s transformation, beginning with the signings of Greg Holland and Mike Dunn last winter. “Greg Holland and Mike Dunn have been fabulous for the mentality of the bullpen,” says manager Bud Black. “They have made a marked difference with the professionalism of that group. There’s no doubt they have set the standard.” So far, the pair have combined for 11 1/3 scoreless innings, and Dunn has performed very well despite his signing receiving lukewarm reviews from commentators. As Groke points out, Holland and Dunn look like far better gambles so far than Chad Qualls and Jason Motte were in 2015-16 (Qualls is currently hurt; the Rockies recently released Motte, and he signed a minor-league deal with the Braves.) Of course, it’s very early in the season. With top starter Jon Gray set to miss at least a month with a foot injury, the Rockies figure to turn to one of Jeff Hoffman, German Marquez or Harrison Musgrave to fill the void, writes Thomas Harding of MLB.com. Veteran swingman Chris Rusin has more major league starting experience than any of them, but he isn’t in contention to reenter the Rockies’ rotation because they like the value he provides to their bullpen, Black indicated. The 24-year-old Hoffman and the 22-year-old Marquez are among the premier prospects in the game, with Baseball America ranking the former 36th and the latter 53rd, and the two garnered some big league experience last season. While the 25-year-old Musgrave hasn’t yet cracked the bigs, nor does he carry a high-end prospect pedigree, he did come close to winning a job with the Rockies during the spring, notes Harding. Outfielder David Dahl, on the shelf since early March with a stress fracture in his ribcage, feels healthy enough to return, but the Rockies are taking a cautious approach with the 23-year-old, per Groke. Dahl won’t be able to swing a bat until at least next week, as the Rockies first want to see the results from the MRI bone scan he’ll undergo April 21. “Honestly, I’ve been saying I’m ready to play. But they said you can feel good, but it still might not be healed,” said Dahl. “They want to make sure the bone scan comes back and it shows it’s healed.” If the scan yields good news, it should put Dahl on track to make his 2017 debut in May. The Rangers have committed about $143MM to their payroll with just three players awaiting contracts, writes Evan Grant of The Dallas Morning News. Pitchers Alex Claudio, Nick Martinez, and Yohander Mendez are expected to sign split contracts soon. Presently, payroll is about $2MM to $3MM more than the club spent in 2015. In my opinion, there is reason to believe the Rangers will have plenty of in-season payroll flexibility since the team unexpectedly made the postseason last year and should contend again in 2016. However, Grant writes (in a separate article) that payroll is expected to remain flat. The Rangers have held preliminary talks with Ian Desmond, per Grant. The content of those talks related to using Desmond as a super-utility player. The most pressing need is in left field, although having flexibility throughout the infield is always in demand. Angels Rule 5 pick Ji-Man Choi could factor into the Angels’ left field competition, writes Alden Gonzalez of MLB.com. Daniel Nava and Craig Gentry are expected to form a left field platoon. Choi has struggled to stay on the field in recent seasons, but he’s healthy entering Spring Training. Interestingly, Choi taught himself how to switch-hit during a 80 plate appearance 2016 season. He’s naturally a left-handed hitter. Giants right fielder Hunter Pence is dealing with Achilles tendinitis, writes Chris Haft of MLB.com. The injury is thought to be minor. Pence spent most of 2015 on the disabled list for three unrelated upper body injuries. San Francisco has solid outfield depth including Angel Pagan, Denard Span, Gregor Blanco, Jarrett Parker, and Mac Williamson. Of course, Pagan and Span are hardly the poster children for good health. Several quality outfielders are still on the free agent market including Desmond, Austin Jackson, and Alex Rios. Recent trade acquisition German Marquez is turning heads in Rockies camp, writes Patrick Saunders of the Denver Post. Marquez, the prospect acquired in the Corey Dickerson trade, throws an easy 95 mph fastball as part of a three pitch repertoire. The 21-year-old former Ray is coming off a 3.56 ERA with 6.73 K/9, and 1.88 BB/9 in 123 High-A innings. 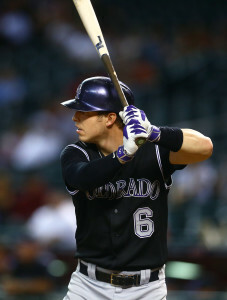 After two weeks of strong speculation about the possibility of the Rockies trading an outfielder, the club has announced the trade of left fielder Corey Dickerson and third base prospect Kevin Padlo to the Rays in exchange for left-hander Jake McGee and right-handed pitching prospect German Marquez. The trade accomplishes multiple goals for the Rays, who will add a high-upside young bat in the form of Dickerson and also clear a bit of money from the payroll by shedding McGee’s $4.8MM salary in the deal. That’s not to suggest in any way that this is a salary dump, of course, as McGee has quietly emerged as one of the better left-handed relievers in the game in recent years. Dickerson, 26, is not yet arbitration eligible and comes with four years of club control remaining. The former eighth-round pick missed most of the 2015 season as he dealt with plantar fasciitis in his left foot and, later, a broken rib, but he should be healthy enough to take regular at-bats for Tampa Bay in 2015. The left-handed hitter is a career .299/.345/.534 hitter with 39 home runs in just 925 big league plate appearances, although those impressive numbers do come with some caveats. For one, Dickerson has crushed right-handed pitching at a .313/.358/.577 clip in his time as a Major Leaguer, but lefties have given him a fair amount of difficulty, limiting to a .246/.299/.377 slash. Beyond that, there’s a nearly 400-point difference between his OPS at the hitter-friendly Coors Field and his mark on the road. Then again, as MLB.com’s Mike Petriello explained back in December, there’s reason to believe that the so-called “Coors Field Effect” is overblown, and Rockies hitters can excel once leaving the team even if they initially possessed gaudy home/road splits. Dickerson’s troubles against lefties, then, could be the greater cause for concern. Defensively, Dickerson has spent the bulk of his Major League time in left field, though he’s seen 200 innings in center as well. Defensive Runs Saved and Ultimate Zone Rating are down on his work in left, although his worst ratings in the eyes of those metrics came in 2015, when he endured multiple DL stints due to the aforementioned plantar fasciitis. It’s easy to imagine that such a painful condition in one’s left foot could hamper outfield range and lead to considerably diminished contributions with the glove. From a broader perspective, it’s not entirely clear how Dickerson will fit with the Rays’ roster. Tampa Bay already has a wealth of outfielders, with Desmond Jennings slotted into left field, Kevin Kiermaier in center field and Steven Souza in right field. With Brandon Guyer and Mikie Mahtook as possible reserve options and the yet-formally-announced newcomer Steve Pearce also carrying significant corner outfield experience, the Rays didn’t have a clear need for an outfield upgrade. Then again, positional depth is a trademark of the Rays, and the team is never shy about adding controllable young talent — especially in instances like this, where the cost of acquisition (at least at the big league level) is a player with just two years of club control remaining. The 29-year-old McGee missed the beginning of the 2015 campaign after undergoing offseason surgery to remove a bone spur from his left elbow. He returned in mid-May, however, and showed no ill effects from the operation, cruising to a 2.41 ERA with outstanding strikeout and walk rates of 11.6 and 1.9 per nine innings pitched, respectively. A partial tear in his left meniscus cost McGee another month later in the season, but he did return at the end of the year to fire 2 1/3 scoreless innings. Over the past four seasons, McGee has been terrific, pitching to a combined 2.58 ERA with 11.4 K/9, 2.3 BB/9 and a 40.9 percent ground-ball rate. He’s exhibited dominance against not only left-handed batters in that time but right-handed opponents as well. In fact, lefties have actually hit McGee harder than opposite-handed opponents, although neither has mustered much in the way of meaningful offense against him. McGee could enter the season as the favorite to close games in Colorado as right-hander Adam Ottavino recovers from 2015 Tommy John surgery. McGee has saved 25 games across the past two seasons and looked to have cemented himself as Tampa Bay’s primary ninth-inning option prior to last winter’s elbow surgery. 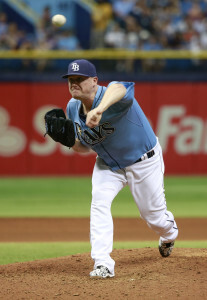 (In his early-season absence, righty Brad Boxberger seized the role and never looked back.) The Rockies will have control of him for at least two seasons, although the possibility of course exists that Colorado will flip him either in July if the team is not contending or perhaps next offseason, when he gets another bump in his $4.8MM salary via arbitration and is only one year removed from free agency. The Rockies have long been expected to trade an outfielder — in spite of the front office’s suggestion that a deal wasn’t a necessity — due to their own surplus of left-handed-hitting outfielders that was created upon signing Gerardo Parra to a three-year deal. In Dickerson, Parra, Charlie Blackmon and Carlos Gonzalez, the Rockies were carrying four somewhat redundant assets, with each of the three incumbent options representing an appealing option to clubs in search of a bat. 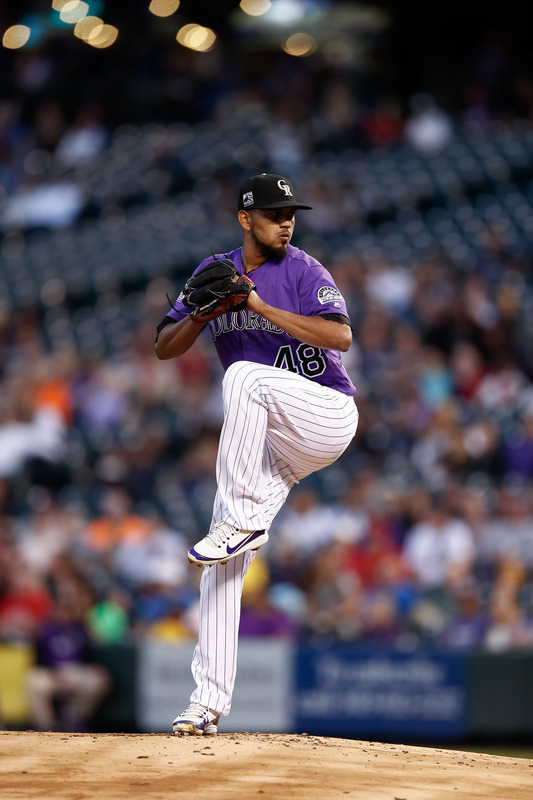 Given Colorado’s own need for pitching, a trade certainly seemed plausible, even if, as GM Jeff Bridich said on several occasions, a deal was far from a given. Turning to the prospects in the deal, Padlo was a fifth-round selection by the Rockies in the 2014 draft. Selected out of high school, Padlo hit .257/.372/.447 across two Class-A levels in 2015 and has amassed a composite batting line of .271/.388/.494 with 19 homers and 41 stolen bases early in his pro career. Baseball America rated Padlo 14th among Rockies farmhands last offseason, noting that he had “impressive power” for a high school player in the draft but has a thick lower half and can get flat-footed at third base, so he’ll need to work on his agility and be conscious about his weight. Marquez, who was on the Rays’ 40-man roster, rated 25th among Tampa Bay farmhands, according to MLB.com’s most recent prospect rankings (a new version of the list will be out soon, as will Baseball America’s full Top 30). The 20-year-old Venezuelan right-hander that spent last season pitching at Class-A Advanced, where he worked to a 3.56 ERA with 6.7 K/9 against 1.9 BB/9 in 139 innings. MLB.com notes that Marquez has been consistently challenged by facing older competition — he was three years younger than the league average this past season, for instance — and has succeeded despite being one of the younger players in each league in which he’s pitched. Marquez offers a low- to mid-90s fastbal with the makings of an average or better curveball and a changeup that’s still a work in progress. His control has improved with each season in the minors as well. Nonetheless, it’s somewhat surprising, in my eyes, that the Rockies felt comfortable parting with four years of Dickerson for two years of a reliever, however excellent he may be, and one mid-level pitching prospect. Colorado, of course, may see considerably more in Marquez than others in the industry, and they may also have had concerns about Dickerson’s diminished plate discipline and increased strikeout rate. Ken Rosenthal of FOX Sports first reported that Dickerson was going to the Rays in a trade (Twitter link). Joel Sherman of the New York Post added that McGee would go to Colorado, and prospects were also involved (Twitter link). Rosenthal further tweeted some additional details on the structure of the deal, and Jon Heyman reported that Marquez was going back to the Rays as well (on Twitter). Rosenthal later tweeted that Padlo was the fourth player in the trade.